First let me apologize for using English. Although I understand German my written skills in that language are horrific; please allow me to use English. 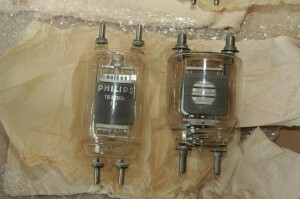 Some years ago Christof and I met on the subject of 833A-amplifiers. Christof was exploring more unusual triodes (his 100TH headphone amplifier being a good example) and I had finished my 833A-amp. Christof wanted to hear an 833A before embarking further that way. As there are not many 833A-amplifiers around he visited me in the Netherlands (near Arnheim; close to the border) and it is fair to say that we soon found common ground on audio: both of us were transformer minded and both of us were looking for audio-alternatives instead of the tubes that everybody uses. This article will take care of the construction on my 833A-amplifier (now using the TB 3/1000 triode). After that I will make an article about the EL82 amplifier I made with my first Silvercore-product (silverstepper). Already in thoughts is a third article describing my DAC-project (using Silvercore trannies). 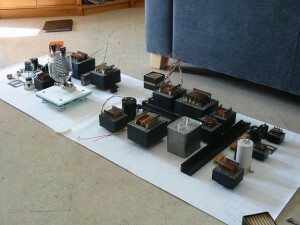 And in long term I’ll make an article about my future amplifier project using 6C45’s, EL82’s and Silvercore transformers. Of course this was not my first project. Like most of us I fiddled with ECC-preamps, gathered some EL84-experience, made a nice sounding 300B-amplifier, etc. But around the year 2000 I was looking for something totally different. So not the standard next step of using 211’s or 845’s….but something really wild. At that time Wavac was promoting its 833A-amplifier: good sounding, nice looking, shockingly expensive. But my interest was tickled and thanks to internet I found lots of ideas (which seldom made it past theory). Besides the shocking price Wavac left also a negative imprint on my when viewed from the inside. Nice CNC-material, nice transformers but PCB’s and mediocre components inside these amps were a real downside. From my normal job (radars and lasers) I’ve seen that component-choice is essential to get the most out of a device; so I would use high quality stuff throughout. Power supply. From earlier projects I’ve a certain method of making power supplies; I will use this quite consistent throughout this amplifier. A classic PI-filter (choke + capacitor; LC) makes a DC-rail quite stable and is “fast” enough to deliver the required voltage at requested amperage. But it is not really clean; there is some spoil left. Using a classical Double PI-filter (LCLC) makes the DC-rail really smooth…..but here the ease of deliverance is smothered. It is virtually choked and can lead to a bloodless presentation. My method is to use the LCLC-principle but the first L is a coreless coil. It delivers the smoothening effect, but will not smother the speed of the powerline. On the picture you can see the power transformer for the filaments 6SN7 (input-tube) and 300B (driver); 2 chokes for the 6SN7 and 300B powerline and the 2 coreless coils for these powerlines. 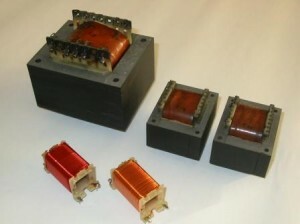 Separate power transformers. If a power transformer needs to produce totally different secondary voltages it is asking for trouble. In my opinion you can take 5V and 6V3 filaments of a transformer, but not B+ voltages at the same time. Of course this will lead to several power transformers (one each for filaments 6SN7/300B, B+ 6SN7/300b, filament 833 and B+ 833). 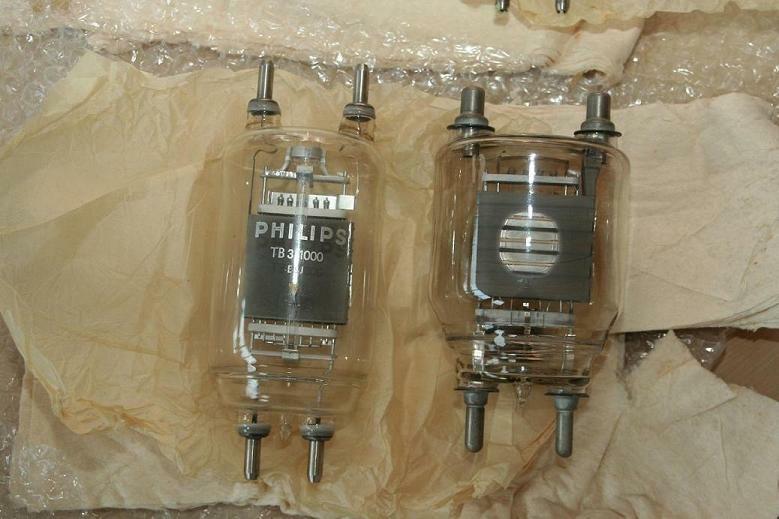 On the positive side: you can switch these transformers separately so the B+ is applied to the tube after proper heating. This will improve life expectancy. Problem with this method of dedicated powerlines: a lot of iron. Non inductive resistors. In total there are 34 transformers, chokes and coils in the amplifier. So there will be some EM-field….. The most common resistors are metalfilm; these are quite prone to EM-field and their value will fluctuate. In effect each resistor will present a local feedback due to nearby transformers. This is not acceptable. From radar and laser experience I have very good results with Caddock resistors (MM, MS and ML-series). 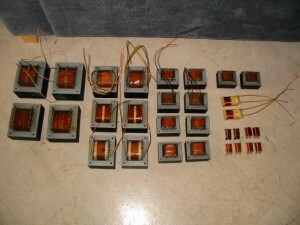 Not only these can take real high voltages; they are also non-inductive and very temperature stable. They sound good too (in fact….not at all !). This in contrast to the other well-known non-inductive resistors like Allen Bradley. These carbon resistors do sound good, but are very prone to temperature fluctuations and are not to be used at high voltages. Ultra-parafeed. Please try to pick up the Vacuum Tube Valley magazine (issue 16) where Lynn Olson in 2001 had a serious good article about Ultrapath, Parallel Feed and Western Electric. In this article was “the periodic table of topologies” with all their pro’s and con’s. 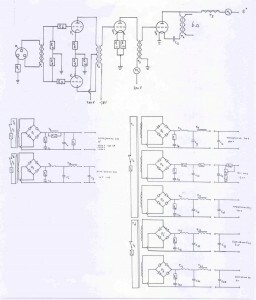 The conventional PP/SE-schematics were compared to the Ultrapath-topology which was becoming quite popular in the USA. 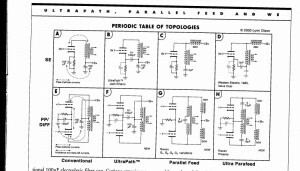 It was also compared to the more classical parallel feed topology (with their background in old transmitter applications). 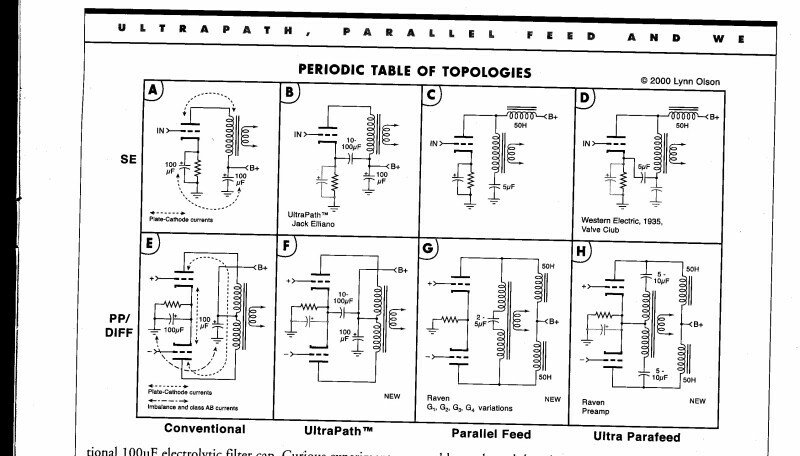 And finally the combination of parallel feed and Ultrapath was introduced as ultra-parafeed. Although not new it is rarely used today (to my surprise). It makes live easy for your output transformer and decrease the (sonic) impact of the powersupply of your audio signal. 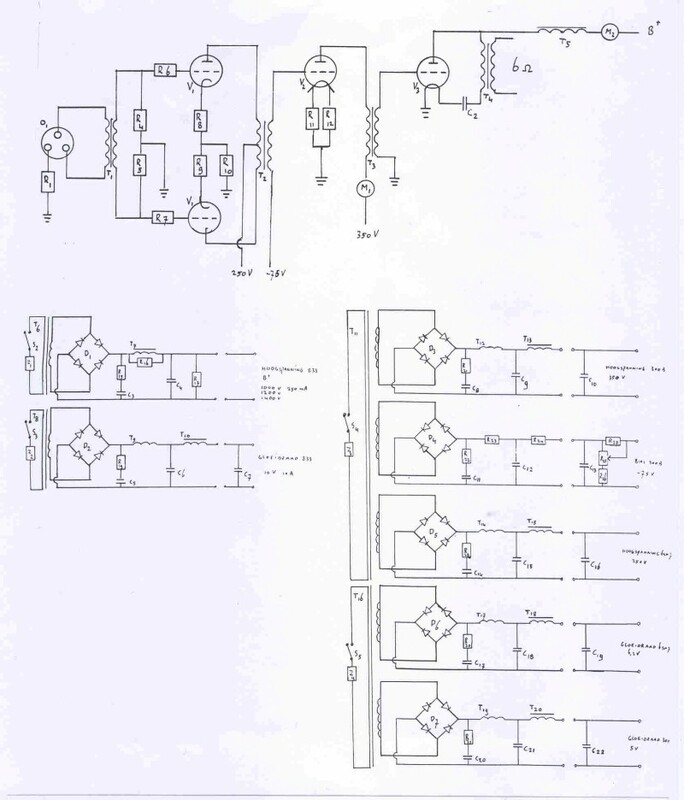 As Lynn Olsen ends his article “for the fearless experimenters, Gentlemen, you may start your engines !” I decided to use the ultra-parafeed topology as a baseline for this 833A-amplifier and all my later amplifiers. Rectifiers. From radar-experience I found out that Hexfred rectifiers were useful as they are less prone to ringing and other overshoot-trouble. Of course I considered tube-rectifying but this means mercury-devices. And I’m not a fan of these items in my living room…. The audio-line is very straightforward with a minimum of parts. 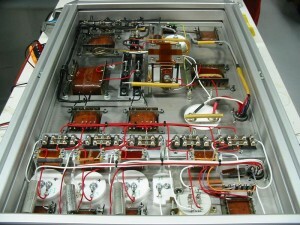 However most of these parts are serious big as this amplifier run between 1000 ~ 1400 VDC. But then you will get 70 ~ 100 Watt Class (A2; grid positively driven like almost all transmitter tubes). 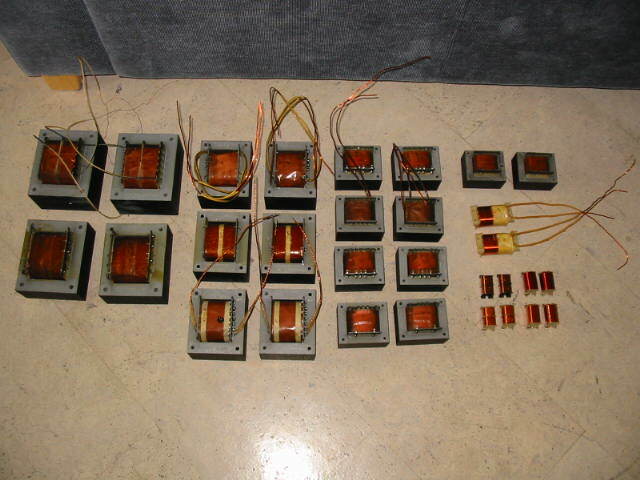 In words: input-transformer → 6SN7 (input tube in PP) → interstage → 300B (driver) → interstage → 833A → output transformer. The powerline is almost boring. A couple of times the following in words: hexfred’s → snubber → coreless coil → first capacitor → choke → second capacitor. 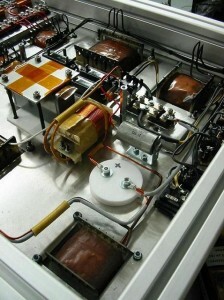 As the powersupply is on a separate chassis the second capacitor is only on the amplifier chassis itself near to the “consumer”. Layout and metalwork. 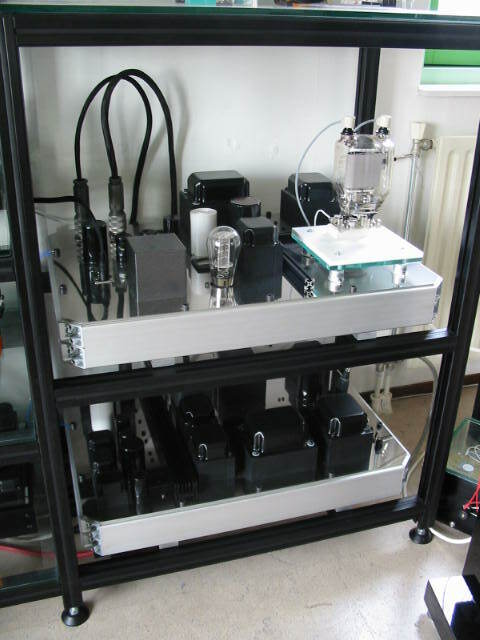 No need to state that this is a big amplifier with 4 chassis each measuring 75 x 55 cm. The top and bottom plates are made from 4 mm stainless steel and already weigh 8 kg each. The sides are made from aluminum construction profile. In total they weigh way above 300 kg. There are no commercial audioracks that will take this size and weight: so again DIY from aluminum construction profile. Innards. 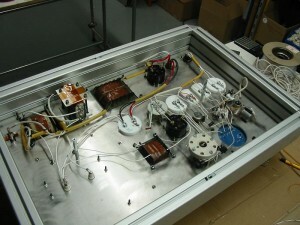 The next set of pictures gives an idea of this amplifier. The powersupply is quite packed with components compared to the audio chassis. The Sound. Of course fiddling with different tubes in this amplifier will have an effect. There are good 6SN7’s and bad sounding ones. The same for the 300B: at least nowadays there is some choice. Even the 833A is made by numerous tube manufacturers so you can do some tube rolling. To describe the sound in one word: effortless. There is oodles of bass-power, stereo-imaging is good, there is a great sense of control. But above anything else: this amplifier coasts along with the music as if it doesn’t have to work at all. And that effortless quality makes you listen for hours and hours without listening fatigue. TB 3/1000. A couple of years ago I did a great discovery of a stash of TB 3/1000 triodes. This Philips triode can be considered as the European version of the 833A. The electrical figures are almost the same; almost no changes were needed. But the mechanical built of the TB 3/1000 is far superior. Here the anode can actual slide along 2 glass rods when the temperature of the anode makes it expand; serious well made. This entry was posted in Röhrenverstärker by Christof Kraus. Bookmark the permalink. I appriciate your blog. I am a bininer of 833a amplifier. I has strong passions for make 833a inte-single ended amplifer. but I could not start the projce. Would you mind advise to me how to make it? I had 833a tubes and sockets but others are not. I hope has your advise. Good morning Lee, if i understand you correct you have only the tubes and sockets and look for a plan, the transformers and all other components ? - how do you want to drive the 833 ? A1 or A2 driven ? - what power you want to get in the end….this will have impact on the B+ voltage….and have serious effects on component-choice ! - what kind of driver you’re thinking about ? - what is your experience with these voltages and kind of amplifiers and do you have preferences ? And that’s for starters. That’s why it is logical to choose a proven concept (see the DIY part of the Silvercore website and look for the 833C-amplifier) otherwise it will cost you serious time and money to develop an 833-amplifier. 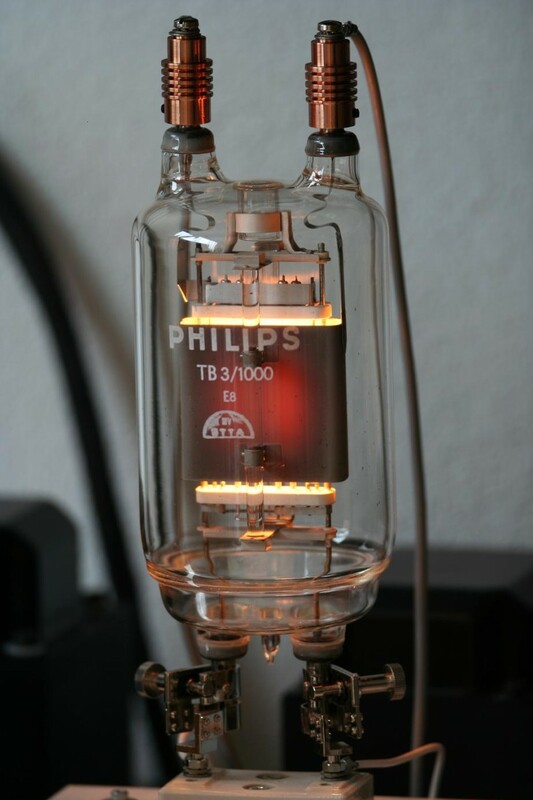 The 833 itself: mighty triode ! With these monsters you’re able to drive a lot of loudspeakers as they are capable to deliver (good sounding) POWER. The 833-triode is even made today (so no fears of tube-stocks running down) and are very very very sturdy made; they will last for ages. Please tell you plans how to continue. It’s always nice to see another 833-amplifier ! Hi there it’s me, I am also visiting this web page on a regular basis, this web page is in fact nice and the users are truly sharing fastidious thoughts.